Our organization is engaged in exporting and importing a precision engineered range of Hex Head Bolts. Owing to the rigorous market surveys conducted by our procuring agents, we are able to associate ourselves with reliable vendors. We deliver these steel hex head bolts widely for high-end industrial purpose and automobile industry. These are acknowledged for wear & tear resistance, cost effectiveness, and long functional life. The Hex Head Bolts offered by us are at par with international quality standards and are available with test certificates. 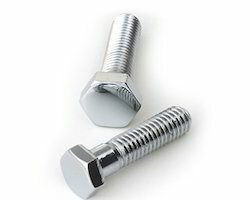 We offer these bolts in various grades to suit the application area at industry leading prices. Further, these stainless steel hex head bolts are also available in various shapes and sizes, and other customized forms as per client''s specifications and details. Standard : ASTM / ASME A/SA 193 / 194 GR. Grade : B 6, B 7/ B 7M, B 16, 2, 2HM, 2H, GR 6, B 7, B 7M. Established in the year 1984, Hitesh Steel is an ISO 9001:2008 certified organization engaged inimporting, exporting, and supplying of a wide range of Industrial Pipes, Tubes, Fittings, Flanges, Sheets and Fasteners. The entire range is procured from reliable and trusted vendors, which ensure that the product we offer is manufactured in compliance with the set industry standards. Further, these precision engineered products have been approved by prestigious ASTM & IBR standards that ensure long working life. Our range finds extensive application in general piping, construction, and other engineering related industries. Our well established supplying channel enables us in catering our ordered consignment within the stipulated time frame in various parts of the globe. Moreover, we continually review our supplying process and ensure systematic procurement process to enhance our performance. We also facilitate our clients and help them conduct third party inspection on our products. This inspection is done by recognized institutes such as Modvat Benefit, wherein stringent checks are performed on all the products that consistently create value for our customers in terms of efficient products. We are guided by our promoterMr. Prakash Bhansali, who holds a rich experience in engineering field. His in-depth knowledge and business acumen have helped us to achieve excellent position in the global arena.